I do not take any credit for any of these tricks, but try them out they work!!! When in a bunker take out your squeege and wave it in the ait. The opposing team will think you are cleaning your barrel and they will charge you and when they come you will be ready. 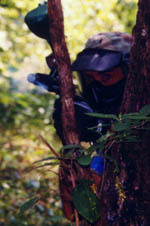 2.When hiding fire your gun upside down so that no balls can feed into the gun which will change the sound of your gun. An experienced player will recognize the sound and try to take advantage.